Computed Tomography (also called a CT or CAT scan) is a noninvasive diagnostic imaging procedure that produces detailed images of any part of the body, including the bones, muscles, fat, and organs. CT scans allow us to visualize diseases that can be difficult to identify with other modalities such as X-rays or ultrasound, and can even detect masses five times smaller than those seen on X-rays. Whereas traditional radiographs send X-rays through the pet’s body in one direction, during CT, X-rays cross through the body at all angles, registering light and dark, shadow and space, digitally in a computer program. With today’s technology CT can tell us more than ever before, and we can now do it without the use of anesthesia. Click here for a video we put together for an interesting case featuring a 13-year-old feline patient with a long history of upper airway noise. Because patients must remain completely still, almost all CT scans are done under sedation or general anesthesia. The use of anesthesia is rare, thanks to the speed of the CT machine we use. Our licensed veterinary technicians and staff veterinarian monitor your pet closely both during and after the procedure, and they perform a thorough exam beforehand to make sure that your pet can safely undergo sedation or anesthesia. • We use a “helical” CT scanner, which completes the study in the shortest amount of time possible while providing the safest and most comfortable experience for your pet. • To ensure quality of service, we carefully select and only employ top-notch certified imaging technicians. 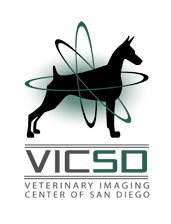 • Your pet will be closely monitored by our caring staff while under anesthesia or sedation both during and after the procedure. • We use reversible sedation or the safest anesthetic possible in order to minimize anesthesia time. • Refrain from giving your pet any food for 12 hours before the appointment. Water is allowed. • Check with your veterinarian or the VICSD staff before stopping any medication prior to the procedure. • Call our office at (858) 634-5430 to check the appointment time and get any last-minute questions answered. While the CT itself has no side effects, the after effects of anesthesia, if it was needed, can last 12 to 18 hours following the procedure. We may ask that you wait a few hours after returning home to feed your pet, and we will go over instructions with you once your pet is discharged.